Welcome to Kabul:Reconstructions. You can follow the information below, which has been gathered from a number of sources by a number of participants (click on the names at left for bios), to reconstruct your own picture of events in Kabul since this site was launched on March 8th, 2003 and, in a sense, since the reconstruction of Afghanistan began somewhere in the winter of 2001-02. Some of this information has been provided in response to specific questions submitted by visitors like you. Please note that this section of the project is now maintained as an archive and has not been updated since 2005. Click here to ASK A QUESTION. The Hindu (India) December 18, 2003 THE LOYA JIRGA Robert O. Blake, Jr., Charge d'Affaires, U.S. Embassy, New Delhi. WINDS of change are sweeping across Afghanistan. 's fertile river valleys, deep gorges, deserts, and snow-covered mountains. After a quarter-century of war, Soviet occupation and extremism, the Afghan people are enjoying new freedoms and restored liberties. For the first time in decades, the country is largely at peace. During the last two years, Afghanistan has reached many social, economic and political milestones: an internationally recognised government is in power; schools have reopened; a new banking law is in place; a new currency replaced the many previously in circulation; the road from Kabul to Kandahar is now paved; businesses are blossoming around the country; and - most importantly - Afghans have renewed hope and optimism.This month, Afghanistan marks its next important political milestone by taking a dramatic step toward becoming a moderate, representative and Islamic republic that values the welfare of its citizens: Afghanistan is ratifying its new constitution. This week, a 500-person constitutional Loya Jirga (great council) convened to deliberate upon and adopt a new constitution. Just as America's founding fathers gathered in Philadelphia over two centuries ago to build political consensus, give shape to their political institutions and enshrine the values of a new republic at the Constitutional Convention, so too, are the Afghans embarking on a process to craft a constitution that celebrates their culture and represents their highest aspirations. This process was put into motion in October 2002 when President (Hamid) Karzai created a nine- member Constitutional Drafting Commission. In April 2003, a 35-member Constitutional Review Commission, including seven women delegates, undertook revisions. The Commission started public consultations in June and, through a series of town meetings, sought the views of tens of thousands of Afghans across the country and from refugee communities in Iran and Pakistan. After drafting and consulting with a cross-section of Afghans for over a year, the Afghan Government unveiled the draft constitution on November 3. On December 14, a constitutional Loya Jirga , that represents Pashtuns, Tajiks, Uzbeks, Hazaras, Nuris, Turcomans, Baluchis, and other ethnic groups and includes 89 women delegates, began deliberating upon and eventually will adopt a new constitution. To emphasise the importance of civil society participation in this process, President Karzai decreed that militia commanders and government officials will not participate. The draft constitution provides for a bicameral legislature, with an upper and lower house. Members of the Wolesi Jirga , or lower house, will be elected for five-year terms. The upper house, or Meshrano Jirga , will consist of a mix of appointed and elected members. One- sixth of its representatives will be women, appointed by the president. The National Assembly will promulgate laws, ratify treaties, approve budgets, and question Ministers in the Government. The constitution also establishes a strong presidential system. To become President of Afghanistan, a candidate must receive 50 per cent of the popular vote, or a runoff election will take place between the top two candidates. The President, eligible to serve two five-year terms, is both the head of state and the head of government. The constitution also divides the country into provinces, each governed by a provincial council with the members elected to four- year terms. Each village and district will also have councils and members elected to three-year terms. In addition to outlining the structure of government, the draft constitution establishes protections for human rights. It provides for basic rights and freedoms and specifically recognises Afghanistan's obligation to abide by international human rights treaties it has signed. The draft also recognises the important role of Islam in Afghanistan without prohibiting the practice of other religions. Finally, the constitution establishes a single Supreme Court with high courts and appeals courts. There are no separate religious courts. Courts will apply the constitutional and other laws; however, if no provision applies, they may decide issues based on Islamic jurisprudence. India and the United States share common goals for Afghanistan. We both want Afghanistan to succeed in becoming a moderate, democratic country with good relations with all of its neighbours and are both providing assistance toward this end. India has taken a number of important steps to support Afghanistan's reconstruction, including committing $ 170 million, negotiating a Preferential Trade Agreement, and actively supporting the rebuilding of the infrastructure sector, including the laying of roads. India also provided the Government of Afghanistan 60 electronic voting machines to support its effort to build a better democratic process. The United States, for its part, continues to fulfil its role as a friend to Afghanistan by helping rebuild infrastructure in a number of areas, ranging from schools to hospitals to irrigation canals for farming, the livelihood of the vast majority of Afghans. The reconstruction of Afghanistan marked an important milestone on December 16 with the official reopening of the 482-kilometre stretch of highway connecting the capital Kabul with the main southern city, Kandahar. We have also provided $ 14.5 million to support the constitutional process and joined Afghan leaders in seeking additional support from the international community for Afghanistan's democratic transition. We have consulted closely with the Afghan Government throughout the process. The United States supports the democratic efforts that respect human rights of all ethnic and religious groups in Afghanistan. However, let us be clear: this constitutional process derives its legitimacy from the fact that it has been an Afghan process from the beginning. As with the U.S. Constitution, the Constitution of Afghanistan is designed to be a document of the people, by the people and for the people of Afghanistan. Afghans respect the traditional value of Loya Jirgas and their decisions are binding. This week, we are seeing Afghanistan determine its own destiny as it undertakes a democratic approach to ascertain the will of the nation. The resulting constitution will establish a democratic government in keeping with the unique cultural values of the Afghan people. Talking about a constitution Dec 18th 2003 | KABUL From The Economist print edition THE grand assembly, or loya jirga, appointed to promulgate Afghanistan's new constitution�and set its democratic future�began, on December 14th, with tears. Some children sang a lament to their nation: �Everyone in his turn has broken your heart.� Yes indeed, and many of them were sitting in the front row. Two years after the fall of the Taliban, one can hardly look at Afghanistan and not reflect on things to come in Iraq. At least Saddam Hussein has been dragged out of his hole; Osama bin Laden is still at large. Afghanistan has yet to resolve its power struggles, and the resulting insecurity means that large portions of the country are off-limits to aid workers. The country exports little but opiates, and a reconstructed Afghanistan�let alone a prosperous one�still seems a very long way off. If anything, the loya jirga confirmed one truth: Afghanistan will be rebuilt only with the acquiescence of warlords and drug pushers. Centre-stage was clean enough. The president of the transitional government, Hamid Karzai, sat next to the 89-year-old former king, Zahir Shah, now reduced to the symbolic role of �father of the nation�. The monarch gave a tidy speech, in effect winding up a kingship which began in 1933 and sputtered on in exile after he was deposed in 1973. Mr Karzai, on the other hand, missed a golden opportunity. Instead of something snappy and passionate, he issued a dreary progress report, the finer points of which were lost on less literate delegates. There are 500 delegates in all, from across the country. A fifth are women. But it is unclear what influence, if any, the delegates will really have over shaping the final version of the constitution, most of which had been negotiated before they made it to Kabul. The biggest issue is political: should Afghanistan have a parliamentary or, as the draft now has it, a centralised presidential system? Mr Karzai made his own views clear. He told delegates he would not run in next year's elections if they chose a parliamentary system. Afghanistan is too immature to deal with a division of powers, and the might of regional warlords militates against the federalism some would favour, he reckons. Most of his ministers agree. They would like to see two vice-presidents; or maybe three, which would keep the factions happy while helping to tie them to the centre. An exception is the defence minister, Mohammed Fahim, who quite fancied being prime minister. He now seems resigned to sticking to his defence portfolio and giving up a bit more of his private army, on the unspoken understanding that no one looks too carefully into his business affairs. Still, Mr Fahim is not to be underestimated. He showed savvy in turning up to the loya jirga in the get-up of a jihadi commander, an image reminiscent of the struggle against the Soviet occupation that ordinary Afghans appreciate. The national anthem turned out to be a sticking point for many Pushtun delegates; they resent seeing their language usurped by Dari, the local variant of Persian, and would like more power at the expense of Mr Fahim and other northerners. But they are divided on the question of the monarchy, which some of them would like to revive, and on Taliban moderates, whom some want to see brought back into the fold. Many Pushtun delegates, when interviewed in a quiet corner, revealed reservations about Mr Karzai. But most said they will throw their hat in with him and a strong presidency; he may be Americanised, but Mr Karzai is still a Pushtun. The danger is that in tailoring a presidency to suit Mr Karzai, Afghanistan is putting all its eggs in one basket. What if something should happen to him? What if he wins next year's election and goes to ground or turns bad, or else is beaten by a candidate from the thuggish school of Afghan politics? No one, though, has come up with a better alternative. Another question to be settled by delegates is what sort of legal code Afghanistan should have. Judicial reform, overseen by Italian officials, has been messy. The government has skated over the issue, to its peril. The 1964 constitution called for laws �in keeping with the principles of Islam�. The new jihadi-fuelled draft calls for �laws in keeping with Islam�. A subtle change, but a worrying one for human-rights advocates. There are large bits of the legal code, they fear, to which sharia�or Islamic law�punishments such as amputation and stoning could be applied. Even more worrisome is the manoeuvring of Abdul Rasul Sayyaf, a conservative and piratical warlord, to head the new judiciary. Delegates appeared aghast at the thought, but a few ministers hinted a deal might be in the offing. Afghanistan's fate hangs in balance 19 December 2003 2:10 AM Bangkok Post (Thailand) Representatives from right across Afghanistan are meeting in the capital Kabul to debate the country's new constitution. The draft contains 160 separate articles. With 502 delegates covering the entire spectrum of Afghan society in attendance, the task will be a torturous one indeed. Exacerbating the difficulties are long-held traditional views, recent wars and often violent squabbling. Despite international pleas to delegates to put the past aside and consider the future when debating this constitution, this has been virtually impossible. Traditional views raised their ugly head early on. After chairman Sebaghatullah Mojadeddi announced there would be three deputy chairmen, 13 men and three women contested the posts, and three men were elected. The 100-odd females present protested there should be at least one woman as deputy because while women make up only 25% of the grand assembly, they comprise 50% of the population. Mr Mojadeddi, a former president and religious scholar, responded correctly that delegates had to respect the vote. ``Women are free to vote for men,'' he said. ``Men are free to vote for women. We cannot make this separation.'' But after more pressure from the floor, his upbringing overrode his dexterity and he made the assembly's first faux pas. ``Don't try to put yourself on a level with men. Even God has not given you equal rights because under his decision two women are counted as equal to one man,'' he blurted. Although thought a moderate, Mr Mojadeddi was raised under sharia law, which states that the testimony of two women in most cases is equivalent to that of one man. In one breath, he incurred the wrath of the women and modern-thinking male delegates and exposed the great difficulties the grand assembly is facing in trying to overcome ingrained traditional beliefs. After some heated words and a threat by the women to walk out, Mr Mojadeddi announced the grand assembly would have four deputy chairmen instead, one of them a woman. Safiqa Sadiqi of Jalalabad was selected. Just two days later, as the delegates were about to split into 10 groups to better debate the first 40 articles of the draft, another comment exposed the fragility of the peace inside the tent serving as the assembly's venue. Malalai Joya, a female delegate from western Farah province, criticised the mujahideen and called for them to be put on trial. The mujahideen had resisted the Russian invaders two decades ago. Troops needed to keep the peace as dozens of angry mujahideen rushed the stage to demand that Ms Joya be expelled. Those loyal to the Taliban are also still a worrying presence in Afghanistan, and while peace and security have returned to Kabul, under the watchful eye of international peacekeepers, the rest of the country, especially the south and near the Pakistan border, remains a lawless and violent land. Delegates to the grand assembly, or loya jirga, have shown that it will take more than a constitution for Afghanistan to become a united nation. It will also take more than the eradication of Taliban remnants and the calming of fighting warlords. It will take a generation, or perhaps longer, for Afghanistan to purge itself of its deep, traditional beliefs and scars from past civil wars and conflicts. The ousting of the Taliban was a significant, but only tiny, start on a road which will be long, treacherous, undulating and full of potholes. While the international community can help supply the road- making materials and some form of constitution can set the rules, the smoothness of that road will ultimately be decided by how quick Afghans can overcome prejudices and work together as one. 10 committees with its leadership Under Tent of Loya Jerga First committee is leading by Ustad Rabani Second committee is leading by Ustad Sayaf Third committee is leading by Ahmand Nabi Muhammadi (son Moulawee Nabi Muhammadi) Fourth committee is leading by Mohammad Tahir Fifth committee is leading by Ayatullah Muhsini Sixth committee is leading by Moulawee Gul Muhammad Seventh committee is leading by Dr.Mashahed Eight committee is leading by Ahmad Farid (son in law of Eng. Hekmatyar) Night committee is leading by Hashmat Ghani Ahmad Zai (brother of Finance Minister) Tenth committee is leading by Moulawee said Mohammad Hanif One Journalist and one secretariat have been appointed for each group. Far Eastern Economic Review December 17th. 2003 Afghanistan: Let's Make A Democracy; In order to secure the kind of government he seeks, President Hamid Karzai may need to make some concessions to the opposition By Ahmed Rashid/Kabul In a contentious and colourful political gathering that will determine the future shape of Afghanistan, President Hamid Karzai is directly confronting the greatest challenge to his authority since he was elected last year. The loya jirga, or grand assembly, opened on December 14, after a three-month delay, to debate and ratify a new constitution that will allow the government to hold presidential and parliamentary elections next year. Two years after the United States military drove the Taliban from power, Karzai, with American backing, wants the assembly of delegates from all over Afghanistan to approve a centralized presidential democracy. His opponents would like a parliamentary system that avoids giving too much power to a single leader, and say that Afghanistan is not ready for early elections anyway. In an enormous white tent heated against the bitter winter cold, 400 men and 100 women-450 elected delegates and 50 Karzai appointees-are meeting, dressed in a mesmerizing array of costumes and headgear symbolizing their ethnic affiliations. From this group, Karzai needs a simple majority to pass the constitution, and he is expected to succeed-with some concessions. In the final few days before the start of a gathering that could last two weeks, American diplomats and Karzai's officials worked around the clock to swing blocks of delegates to their side by offering their leaders concessions on other parts of the constitution. 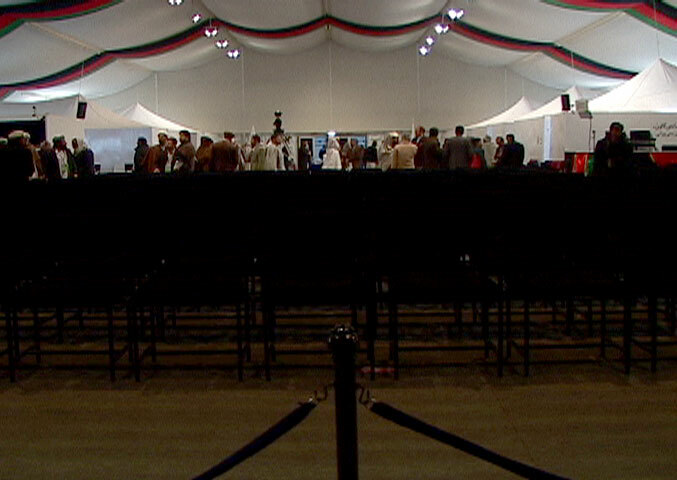 Several of Karzai's ministers complained that Karzai had not carried out sufficient political lobbying among the delegates before the loya jirga opened. Nearly half of the delegates, joined in several opposition groups, oppose the presidential system outlined in the draft constitution. Instead they seek a parliamentary system with a president and a prime minister, a more powerful parliament and greater provincial autonomy. In the past 35 years Afghanistan has gone through a monarchy, a republic and communist and Islamic regimes. In Afghanistan, "the balance of power is not favourable to the centre. The centre needs to get stronger," says U.S. Ambassador to Afghanistan Zalmay Khalilzad. "But where the balance is has to be decided by the loya jirga," he says. "If adjustments [to the draft] need to be made, this is what democracy is all about. It's a big test but I am sure the Afghans will pass." The most powerful opposition group comprises some 100 delegates from ethnic minorities in the north and northeast-Uzbeks, Tajiks, Turkmens and Hazaras-who have temporarily buried their rivalries to oppose the presidential system. The northern opposition has been joined by groups of Islamic fundamentalist delegates from the west and provinces around Kabul, and monarchists and democrats who also oppose the presidential system. On the other side of the ethnic divide, most Pashtuns, the majority ethnic group, support the presidential system and Karzai, who is also a Pashtun. The fundamentalists are demanding more Islamic law and control of the judiciary, while the northern groups want greater provincial autonomy and the direct election of provincial governors. Karzai is likely to offer some small concessions in order to persuade these groups to accept his presidential democracy. However, there are dangers. "Some of these concessions, like fundamentalist control of the judiciary, may prove detrimental for the rule of law in the long term," says John Sifton of Human Rights Watch. Unfortunately, rule of law holds little sway over much of Afghanistan. The Karzai government sees the loya jirga as an opportunity to further legitimize its attempts to disarm the warlords who control parts of the country and wield considerable influence in the central government. Doing so would help Karzai persuade the international community to provide more troops and money for security and reconstruction, which would also ease voter registration and the election process. The U.S. has committed $1.2 billion for Afghanistan this financial year, doubling the amount pledged earlier, while no European country has increased spending. Security concerns were all too clear in Kabul as the assembly opened under the protection of some 8,000 foreign and Afghan troops, in case, says Interior Minister Ali Jalali, "the terrorists-the Taliban or Al Qaeda- mount a suicide-bomb attack or fire rockets from the surrounding hills." Despite the dangers, 87% of representatives showed up to vote. 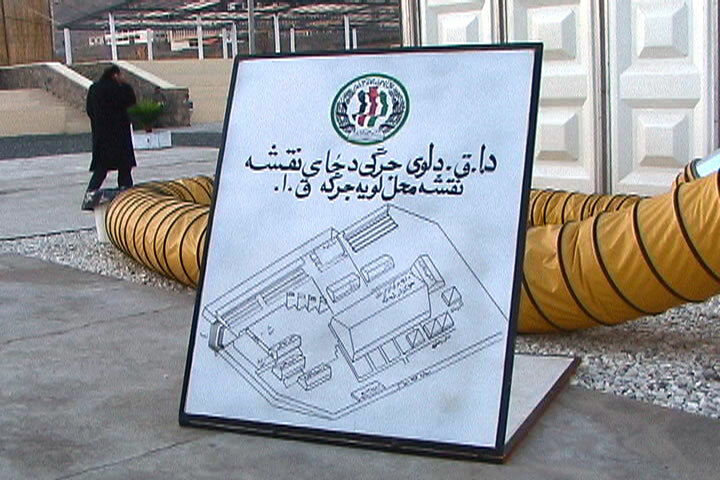 And at the opening, tension also came from within, as nearly 200 delegates circulated a petition to hold a national referendum on choosing a system of government, change the loya jirga's rules of procedure, cancel voting rights for the 50 delegates nominated by Karzai and turn the loya jirga into a permanent shura, or Islamic council. "Karzai wants a dictatorship which people will not accept," says delegate Abdul Hafiz Mansur, a leader of the former Northern Alliance and the former head of state-owned Afghan radio and TV. "The draft [constitution] has been changed 22 times, all through Karzai's dictates, and there are no choices open for the delegates," he claims. Karzai however argues for centralized power. "In countries where there are no strong institutions, in countries where there are remnants of a conflict, we need a system that will run with one centrality, not many centres of power," he said at the loya jirga's opening. In the first few days of the assembly, as Karzai, his supporters and U.S. diplomats bargained with delegates, the opposition weakened considerably. When democracy will take hold remains uncertain. The reconstruction process stipulated in 2001 by the UN Bonn accords called for elections by June, 2004. The UN's special representative for Afghanistan, Lakhdar Brahimi, now says that the country won't be ready for elections by then. "Because of the security situation in the south of the country, we will have to revise our plans," he says. "You could have presidential elections by [autumn] but not parliamentary elections." The Americans and Karzai are now keen to see presidential elections by September, with parliamentary elections to follow later when the security situation improves. Many Afghans as well as the UN, European governments and Western and Afghan aid groups are opposed to rushing the elections. "The security situation has to improve and real reconstruction start before elections can be held," says Vice-President Amin Arsala. Even Karzai admits that "we have reached 40%-50% of the administrative ability that a government in a country like ours should have." However, Karzai and his group strongly support early elections. "We need elections in order to have legitimacy and a mandate for changes the country needs," says Finance Minister Ashraf Ghani. In the build-up to the loya jirga, the Taliban stepped up their assassinations and kidnappings of foreign aid workers and contractors and their attacks on U.S. and Afghan soldiers in southern Afghanistan. On December 2, the U.S. military launched Operation Avalanche, a major offensive in seven southern and eastern provinces "in order to keep the enemy on the hop in case they planned to disrupt the loya jirga," says a senior U.S. military officer. However, public resentment against U.S. forces has intensified after two separate bungled aerial bombings of villages killed 15 Afghan children and two adults in eastern Afghanistan in the first week of December. The dire security situation was highlighted by UN Secretary General Kofi Annan. "Unchecked criminality, outbreaks of factional fighting and activities surrounding the illegal narcotics trade have all had a negative impact," he said on December 8 at the UN. Validating the constitution is only one obstacle in the long battle for Afghans seeking to restore stability to their country. Kabul: Partial Reconstructions is an installation and public dialogue project that explores the multiple meanings and resonances of the idea of reconstruction -- as both process and metaphor -- in the context of present-day Kabul. www.kabul-reconstructions.net is an online discussion forum, information resource, and medium for the communication of questions and answers about the reconstruction between people inside and outside the city of Kabul itself.